Black and white photograph of the interior of All Saints' Anglican Church, 300 Dundas Street West, c. 1897. This view is looking toward the North end of the church. The church was gutted by fire on December 14, 2009, and was restored by 2011. Click the link on the right side of the page to see the view on September 13, 2013. 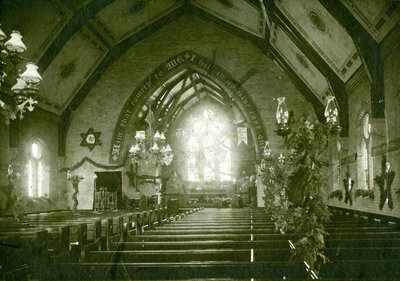 All Saints' Anglican Church Interior, C.1897, Photographer L. Stedham, Whitby Archives 09-002-039.